4. Sick breedables can also be updated using the updater. Now you guys should be all ready to update your breedables when it’s time for an update ….. it’s not time yet! But an update is in t he works as we speak!! *Birds are not affected so 3.0 birds are still good! *Ducks are 1.1 now and 1.0 can not breed. *All ducks age 7 and older will have their cycles reset to 12 and their vigor will be 100 you will not lose the vigor/cycles from this error. I hope this helps clear up any confusion caused by this error and Again I Apologize for the error. Happy Friday everyone! This was a great week for Amaretto with the release of the 4.0 Update! 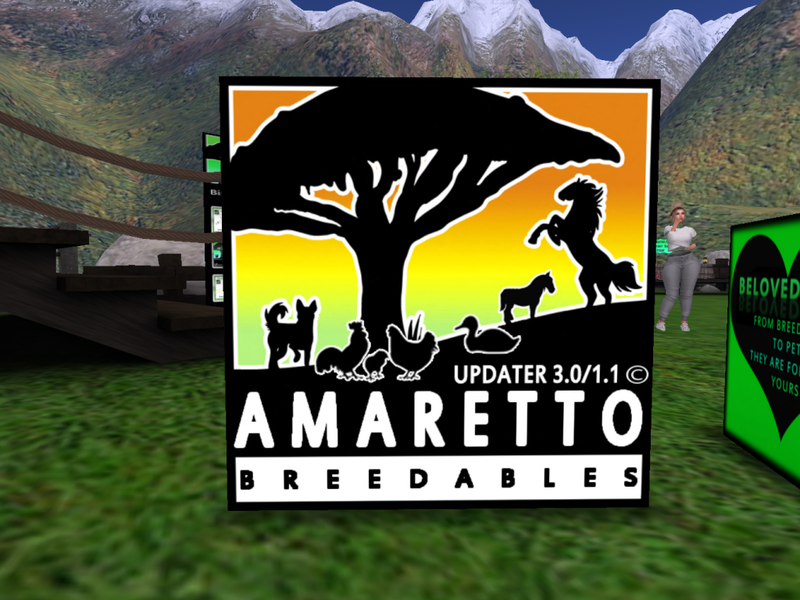 With all the excitement of the update I hope everyone has had a chance to see the beautiful new starter coats, the Amaretto Saddlebred’s. If you’ve not seen them yet use this link to check out pictures of the 4 coat colors on the wiki! There were also 3 very pretty new starter eyes added in this update. The Pineapple, Strawberry and Tangerine eyes are going to look just yummy on all the Amaretto Horses! If you haven’t got to see these eyes yet head over to the wiki and have a look at them. 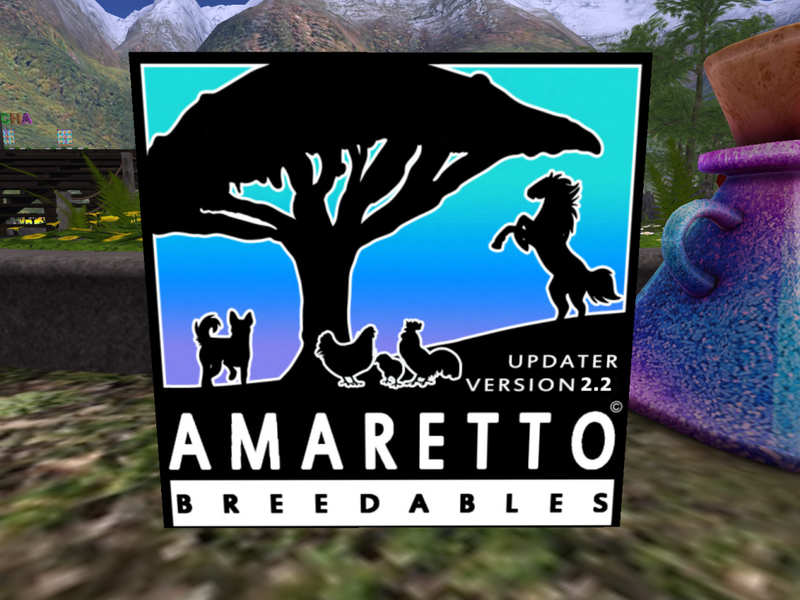 We have heard so many wonderful things from people in the community regarding this update and the entire Amaretto Team is so happy that people are enjoying the update! Now if the starters would just hurry up and drop babies …..
Well lots of stuff happening on the ranch today! 4.0 Update was released as promised! What does this mean? Its time to head to your favorite Amaretto location and pick up your 4.0 updater today! Lots of fixes and surprises in this update, I cant tell them to you but…….I can say breed em and find out ! Also all the haven horses have been updated to 4.0, they are just like the new starters located in the store! After Monday September 23, 2012 we will NO longer provide support for horses that are NOT v4.0*** So please update your horses!!!! ** PLEASE NOTE** “Put Out to Pasture” (retired) means these will no longer be birthed from starter horses; they can ONLY be birthed from existing horses already on the grid that carry these traits. 2. It will not update pregnant horses. The reason being the updater can potentially abort the pregnancy. Waiting to update your pregnant horses will not affect the horse’s functions, they will continue to eat, move, animate etc. When they give birth to the bundle, then you can update them. The bundle will be the old version and need to be updated when birthed. Be sure to follow the guidelines above for a smooth update! Remember if anything goes wrong don’t freak out just file a ticket! So here we go 4.0!!! Happy updating!!! This is Ava over and out. That’s right its time to update those Barnyard Birds and get those new starters to find out what the new traits will be! We have included some fixes and added some newness so check out the list below! Happy breeding everyone! ***IMPORTANT NOTE***After Monday October 18, 2012 we will NO longer provide support for birds that are NOT v1.1*** So please update your birds and spread the word!!!! 1. Fixed the issue with birds floating up in the air. 2. Fixed the Seniors to not show nesting period. 3. Fixed Bird of the Line root prim issue. 4. Fixed hold position for baby birds. 1. Retired breed Partridge Leghorn. 2. Added new breed Rhode Island White to stater breeds. 3. Added last egg incubated uuid to be stored in the incubator description field. 4. Added feature so that with future updates the incubator can be updated by the updater. 5. Now shows in stats and hover text when a bird is companioned and lists the name of the bird it is companioned to. 6. Added nesting timer to stats. 8. Added all new lower prices for every Barnyard Bird product. 2. The updater will not work on sims with a high load. Dilation needs to be above .65 and region fps must be above 25 for the updater to work. You will get an error message that says the sim dilation is too low, we have enclosed a sim monitor that will display these values for you. Just rez on your sim next to the updater. 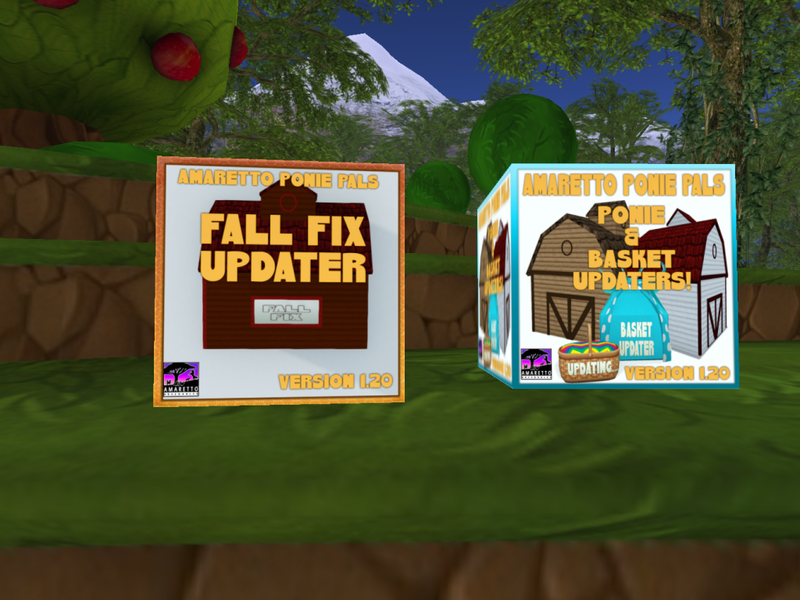 Updaters can also be found at all of the Barnyard Bird store locations!! Barnyard Bird Update Sneak Peak!! So we usually do not give out sneak peaks but these new pretties coming soon via the Barnyard Bird update are just to darn cute to not give you a lil peak. We have some fixes and some exciting new things all wrapped up in this Bird update which we are sure all you Bird lovers out there will fall in love with!! So keep an eye on the connections and notices for the Bird update coming VERY soon!! Hey guys happy Monday! I hope that you all survived ! Well lots going on at Amaretto! We have had a lot of events going on so I hope all of you have been checking your calendars. Also have you seen those Shetland Show Horses? I mean how cute!!!!! I wanted to take a few moments to talk about the Amaretto Museum! 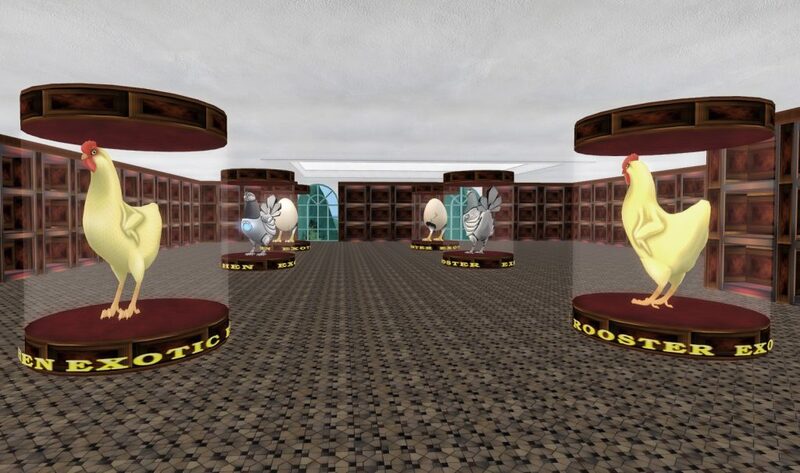 I have completed the Barnyard Birds portion of the museum! So please stop by ! Every animal that Amaretto has released can be seen in world at this location! Please remember that as new stuff comes out the museum is a work in progress! If you do visit please notice that you can click on any of the information plaques and it will take you to the appropriate wiki page so you can find out more details about that breed or coat! Also just a simple reminder while you are here at ARU there are new classes available so check out the schedule that is in the courtyard! There is also a suggestions mail box located there as well so you can make suggestions for classes! Well until next time please stop by the ARU sim and visit the museum! Happy Hump Day Everyone !!!!! I have some great news today the K-9 Update is out Version 1.5 . Please read the information below !! ***IMPORTANT NOTE***After Wednesday August 29, 2012 we will NO longer provide support for K-9s that are NOT v1.5*** So please update your K-9s!!!! 2. It will not update pregnant K-9s. The reason being the updater can potentially abort the pregnancy. Waiting to update your pregnant K-9s will not effect the K-9s functions, they will continue to eat, move, animate etc. When they give birth to the kennel, then you can update them. The kennel will be the old version and need to be updated when birthed. Happy Monday everyone! Have you gotten a new racing trait and ready to head off to the races?? I can hear the bugle call from here! As promised here is some more detailed information on racing and training! 1.) Can only connect one horse at a time to the hud. 2.) Can only wear one hud at a time. When the Racing traits pass they can pass as the same class, one class higher, one class lower or even two class’s lowers. Well I hope this gives you guys a better understanding of the racing and training! Until next time happy racing everyone! Hello everyone! Happy Wednesday! I wanted to touch on something that I have run across. 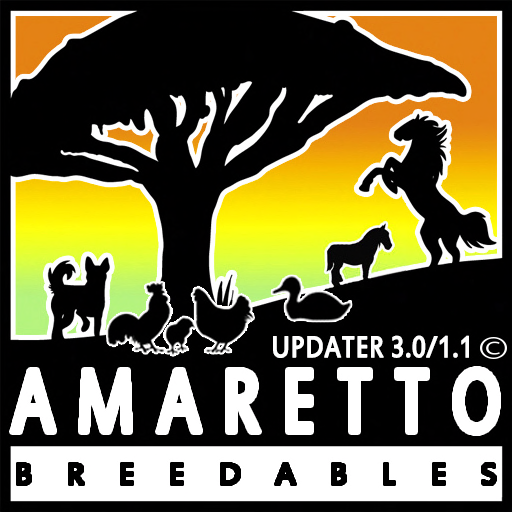 When you go to update please be sure to go to any Amaretto Store and pick up an updater. You might be thinking that clicking on the menu on horse then update this does not work you will need the updater.